Presently, the total number of commercial nuclear reactors in the world is 442, the number of research reactors is 250, and the number of reactors in ships and submarines is 180. By countries: USA – 102 and 14 under construction; Europe – 195; Japan – 55; Russia – 45 and 6 under construction; Canada – 20; China – 13 and 25 under construction. Radioactive spill and contamination may come not only from nuclear accidents, but also from the highly radioactive waste material. This waste grows by 12,000 metric tons per year—a volume equivalent to 100 double-decker buses or a two-story building with a footprint the size of a basketball court. By year 2015, it will reach about 250,000 tons. Its management is problematic, and there is a constant leak ending in the food chain, but this is not sensational enough to catch the media’s attention. The nuclear catastrophes in Chernobyl and recently in Japan show that they are unpredictable, and the consequences, unmanageable. A similar disaster might happen in any country relying on nuclear power. The radioactive contamination of the atmosphere and the ocean with its long-term health consequences is equally hazardous for the population of all countries. Are there alternative options that can replace nuclear power? From a scientific point of view, a solution exists, but it has been neglected for decades. Specifically, we must re-evaluate what is currently being taught in the universities concerning the concept of space as “the physical vacuum”. The concept of the physical vacuum adopted at the beginning of the 20th century does not correspond to reality. That is why a wide range of phenomena cannot be explained logically. While human logic is blamed for the failure, the enigmas themselves are indications that some of the adopted assumptions are wrong. Since mathematical logic does not have the restrictions of physical reality, abstract theories can be built which are based on wrong assumptions. But sooner or later, physical phenomena will be encountered that cannot be explained by such theories. This kind of physics does not offer a complete understanding of processes in the micro cosmos. According to current teaching in physics, nuclear energy arises from the nuclear forces, yet the physical origin of these forces is a mystery. Why? This is because according to the currently adopted concept, the space is empty, while at the same time it has quantum mechanical properties. Many physics scholars are not aware that in 1922 Albert Einstein came to the conclusion that there is an indispensable need for a space-filling ether. “According to the general theory of relativity, space is endowed with physical qualities; in this sense, therefore, there exists an Ether. According to the general theory of relativity, space without ether is unthinkable.” Much accumulated evidence now indicates that space contains a unique superfine but dense lattice structure whose elements are far beyond the reach of the most powerful electron microscopes. It possesses not only quantum mechanical properties but also defines the speed of light, the relativistic effects, the propagation of Newtonian gravitation, inertia, and the electrical and magnetic fields. In contemporary physics, only some of the properties of this structure are described by mathematical expressions, while its existence is dismissed. This leads to incomplete knowledge of some essential physical processes at the level of the micro cosmos. The correct understanding of these processes is of vital importance now at the time of the global energy crisis. 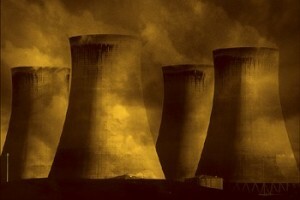 The main question is: Is there a safer replacement for nuclear energy? The correct answer is: Yes! It comes from the revised concept of space—the physical vacuum [5,6,7]. The superfine structure of the physical vacuum is a source of two types of primary energy: (1) Static Energy not of EM type related to gravitational mass with a detectable signature: Casimir Forces; and (2) Dynamic type of energy (lower amount), which is behind the electrical and magnetic fields and has a detectable signature of 2.72K estimated from the Cosmic Microwave Background. THE STATIC TYPE OF ENERGY IS THE PRIMARY SOURCE OF THE NUCLEAR ENERGY. IT IS NOT CONTAINED IN NUCLEI BUT IS UNIFORMLY DISTRIBUTED IN SPACE, SO EVERY CUBIC CM CONTAINS 1.37 E20 JOULES = 3.8 E13 (KWH) OF THIS ENERGY. IT IS ALSO THE SOURCE OF THE DYNAMIC TYPE OF ENERGY, KNOWN AS ZERO POINT ENERGY (ZPE), WHICH COULD BE REACHED BY SPECIFIC ELECTROMAGNETIC INTERACTIONS. The alternative solution for replacement of the energy from nuclear plants will come from development of other methods and techniques for extracting energy from the primary source (1) mentioned above. The theoretical understanding of this non-EM type of energy is elaborated in the treatise BSM – Supergravitation Unified Theory (BSM-SG). The theory also describes the structural features of the electron that permitted to suggest a method for accessing this hidden space energy. The method, called the “Heterodyne Resonance Mechanism,” involves an electromagnetically activated plasma where quantum mechanical interactions occur between oscillating ion-electron pairs and the space-time continuum. Other alternatives to nuclear power, such as Cold Fusion and Torsion technologies, access the same primary source and they also lack official support. In the university text books of the past 50 years, information that could challenge the validity of the ether concept was gradually excluded, so generations of physicist are presently unaware of the problems discussed amongst physicists in the first half of the 20th century. Since the ether was not accepted, it could not be envisioned as the primary source of nuclear energy. This has had a direct impact on research that might lead to alternatives to nuclear power. Although such research has not been officially funded, it has been addressed by some lone researchers and research groups. In the time of the Internet, this new research, known as free energy, zero point energy, or energy from the vacuum, has spread to different countries. It involves individuals or collaborating groups. Without funded scientific research, however, the physics is not well understood and the positive results are sporadic or not reproducible. The lack of official support, as well as opposition from some established scientific groups, diverts attention from this research. One additional concern, expressed by us, is the need for simultaneous research on the side effects. When exceeding some power level the Zeropoint energy devices may radiate scalar (longitudinal) waves that have some biological effects. Most individual researchers are not aware of this issue. One should remember that the adoption of nuclear energy, for example, was preceded by decades of scientific research on radioactivity. Consequently, the new technology based on the energy from the physical vacuum may not be suitable for use in the home, so it should still be centralized. The most suitable location initially will be the nuclear plant locations, where the existing infrastructure may be used for power distribution. Environmental damage with health consequences from a nuclear catastrophe is a more immediate threat than global warming. Alternatives to nuclear energy based on methods not recognized so far must be considered, such as the possibility of accessing the energy of the physical vacuum by the Heterodyne Resonance Mechanism. The need for scientific research on these alternatives must be officially recognized and funded. Implementations of promising technologies could be made available in the very near future. The safer replacement of nuclear energy will not eliminate the need for oil, but could ease the tension caused by gradually shrinking oil resources. Note: List of most dangerous radioactive products. The video  shows how they are detected and the units of measurements. Strontium-90: half-life of 30 yrs, penetrates through skin, in bone marrow causes leukemia. Plutonium-239: half-life of 14.4 yrs, the main and most dangerous product of the nuclear fuel, difficult to detect alpha emitter. A micrograms dose of Plutonium leads to ill conditions, with a life expectancy of less than ten years. Dr. Stoyan Sarg Sargoytchev, 35 years in space research institutions of Europe, USA and Canada, currently with York University, Toronto, experimenter and theorist, author of monographs: BSM-SG Unified Theory and Field Propulsion by Control of Gravity, international collaborator with ZPE research groups, over 80 scientific publications. Acad. Dr. Asparuh Petrakiev (two doctorates), a retired professor who has had a broad international collaboration, (professor in Department of Nuclear Physics, Sofia University, /1963-78/, senior fellow researcher in KFA-Julich, Germany as a member of the International Agency for Atomic Energy, Vienna /1974-75/), a member of the International Academy of Ecology and Life Protection Science, over 300 scientific publications. Dr. Andrew Michrowski, Dott. Arch, President of the Planetary Association for Clean Energy, a Canadian Learned Society and an international collaborative network of advanced scientific thinking with an emphasis on peer review of fundamentals of advanced physics and electrodynamics. Over 100 scientific publications. Dr. Victor Zhuravlev, Novosibirsk, Russia, former Director of the Filial of Sibir’s Center for Anomalous Phenomena, Novosibirsk, multidisciplinary research including: mechanisms of chemical reaction – radiolysis, termolysis, photolysis, and search for new energy sources. Dr. Todor Proychev, a retired professor with an European international collaboration in the field of control engineering, over 60 scientific publications. A. Einstein, Sidelights on Relativity, translated by: G. B. Jeffery and W. Perret, Methuen & Co. London, (1922); republished by Dover, New York, (1983), p. 23. S. Sarg, Basic Structures of Matter – Supergravitation Unified Theory, NLC archive 2002, Trafford Publ. (2006), Chapter 5.